Guest post by Jill Neff. I know every word by heart, but today I look at the card as if I expect it to speak to me. Flowing handwriting, faded with time, passed down from one generation to another. The ingredients sit silently in a line on the counter, like little toy soldiers, waiting for me. And I know if I don’t start soon, this pie will not be finished in time. I linger, letting my mind wander back in time to a young bride. She walks through the field to the house next door. A gentle woman she now calls mother-in-law waits to teach her the intricate secrets of baking so the bride can indulge her new husband’s sweet tooth. 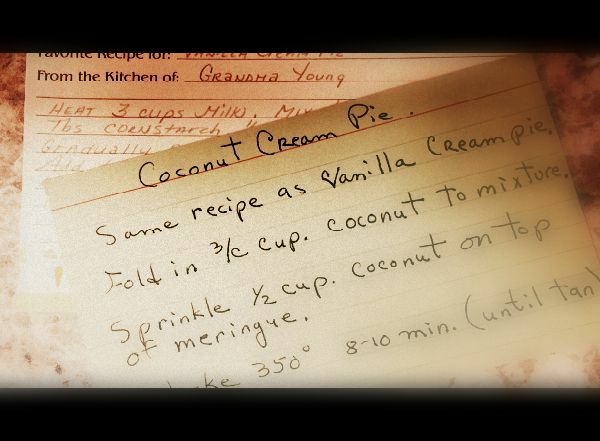 Her recipe book quickly fills with everything from sugar cookies and date nut cake to chocolate and coconut cream pies! Reluctantly, I’m drawn back to the present, reminded by my “little toy soldiers” that I need to get moving. How quickly time goes by. The new bride is now white-haired, and those hands that so eagerly worked in the kitchen are quiet now. No more enticing smells rise from the oven and no sweet treats cool on the counter. I should not dawdle, but today I am compelled to consider this faded old card. The white-haired, long since bride is my mother, and her recipes are now my recipes. But time is not my friend. Yesterday we sat together, quietly talking as the world flowed by around us. These days, I gently provide context when she can’t remember, but I do most of the talking. And try to imagine what it will be like when the last ray of recognition leaves her eyes. I wonder how long my brother and his sweet wife can continue care in their home and how my siblings and I will manage. I try to be brave, but I am not. I try to trust, but it’s hard. And I try to pretend she will not forget me, BUT SHE WILL. Dementia. It splatters paint with a broad brush with no regard for the subject or the canvas. There are good days. And there are bad days lurking just around the corner in the shadows. Changes and questions without answers abound. I cling to them like a drowning man to a life preserver. My biggest fear exposed, yet in five little words, I find my answer. My mom won’t stop loving me. She just won’t remember that she loves me. There’s a big difference. The Holy Spirit has a deeper lesson for me today. Walking this path may bring constant changes, but I am walking with the One who is UNCHANGEABLE! I am walking with the One whose love is everlasting and who will never forget that He loves me, even when my fainting heart thinks otherwise. Unchanging promises and never-ending grace. There is no other way to do this journey, but with my God. Truth brings peace, and my soul is quiet. All this. From a faded recipe card. Lord, when the journey seems unbearable, help me to walk closer and cling harder to you. When the path is rough, give me grace and strength for what comes next. And I will trust in your everlasting love and rest in your comforting presence! < Previous Breakthrough. How Autism teaches me the Gospel.